We would like to take a moment to introduce our NEW DT!! Thank you so much to all of you who showed your interest in joining our team! 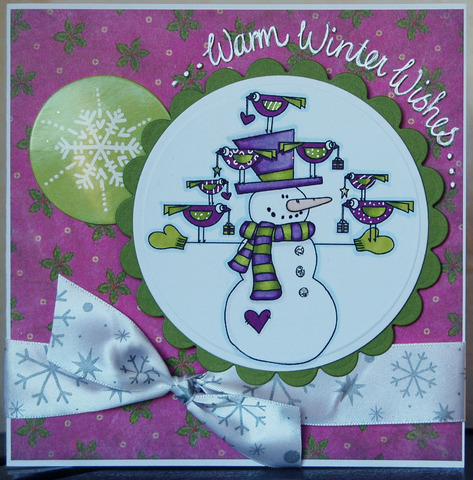 We were so inspired by your blogs, and challenge creations and it was not an easy decision to make! We have chosen 5 new members which brings our team to 14 members. Don't be discouraged if you were not chosen this time around! Please join us again for future DT calls. We will be dividing our team into two groups and we will alternate weekly challenges. You will still find a new challenge here every week, and you will see inspiring samples from 7 team members each week as well! 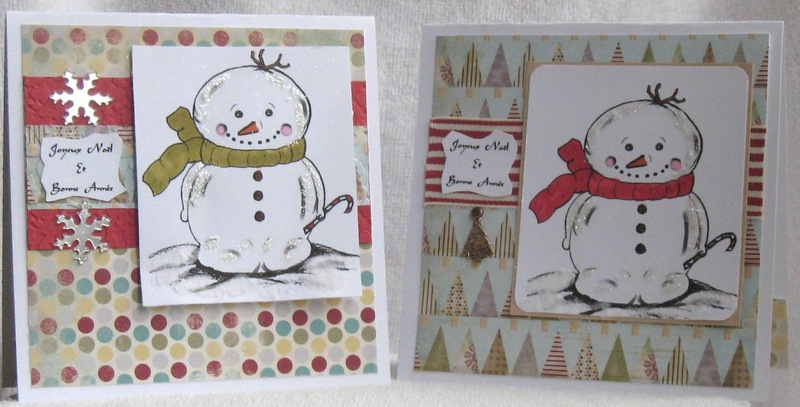 Please welcome the newest members of CRAFTY CREATIONS DESIGN TEAM! 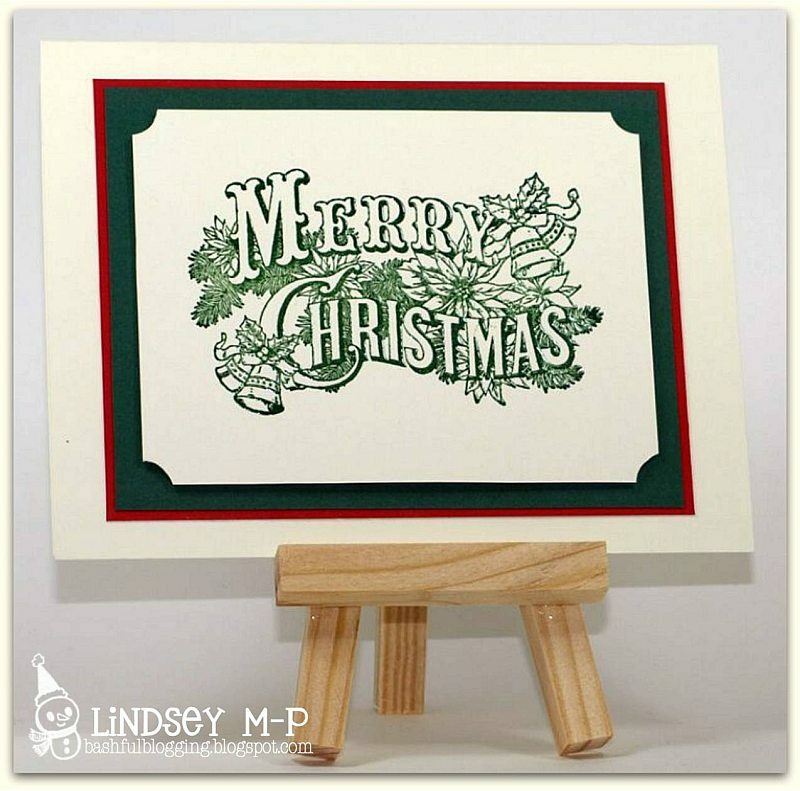 LINDSEY has been on our team this past month as a guest designer and she has shared beautiful and inspiring creations with us all! 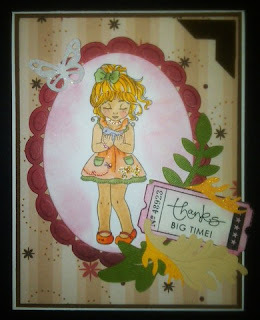 You will be treated to more of her lovely work and watch as she rocks those fabulous CAS cards!! RUDLIS has a truly elegant style and creates cards that have real vintage charm! She works magic with her embossing, punches and die cutting!! KAOS may be her chosen name, but her cards are anything but kaotic! She has a fabulous sense of style, color and composition and combines different elements with ease; a true artist! KATHLEEN wraps up her gorgeous designs like presents!! To me, she is like a fairy godmother dressing Cinderella for the ball!! 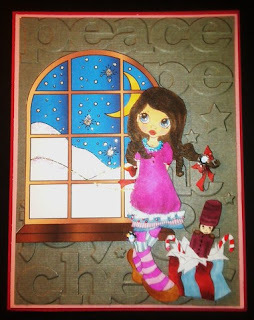 She adds beauty to everything her magic wand touches; embellishing with sweet charms, ribbons and bows, sparkly glitter, and pretty paper flowers! 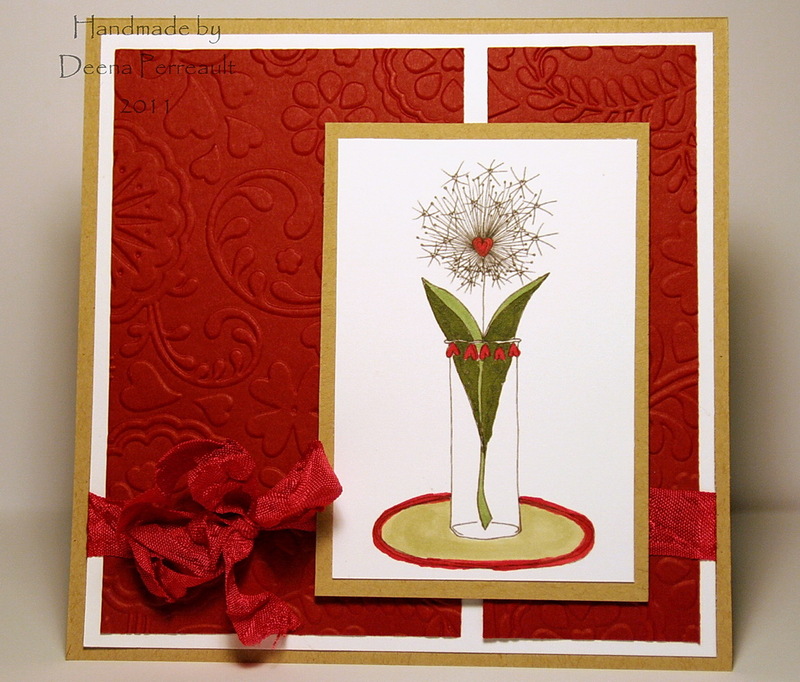 DONELDA has a creative flare and makes fabulous use of color in her projects! She loves to challenge herself and others and shares what she learns along the way! 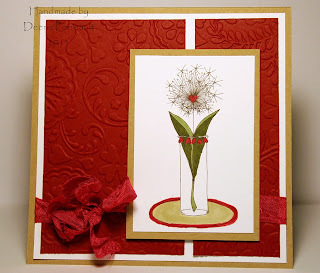 Do have a look at her past Design Basic lessons! WE ARE THRILLED TO HAVE YOU JOIN OUR TEAM!! Please scroll down to find our current CHALLENGE. Wendy please contact Deena for your prize. We have a fun photo challenge for you this week. Below is the photo we hope will inspire you to create! Maybe it will be the colors, the wood, the brick wall or the shelf items or something else from this photo that inspires your creation! We can't wait to see! Link up your card/projects below. Our fabulous SPONSOR THIS WEEK is IN 2 STAMPS! 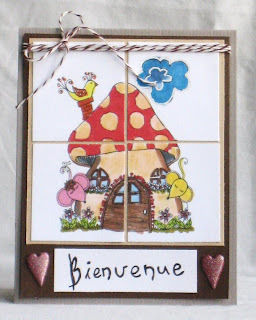 Hop on over to http://www.in2stamps.com and discover our complete range and monthly new releases. Also check out the inspiration bloghttp://in2stamps.blogspot.com/ with hundreds of inspirational ideas! 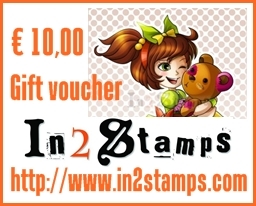 Our Winner will receive a 10 Euro voucher from In 2 Stamps! I just love how Lindsey's card came out. CAS style, what a gem! I feel it has been inspired from the vintage style of this stylish powder room non! Claire has such a pretty framing for her card. Just love the pink and green together. Love the sentiment too. Look at this beautiful vintage shelf Deena created. 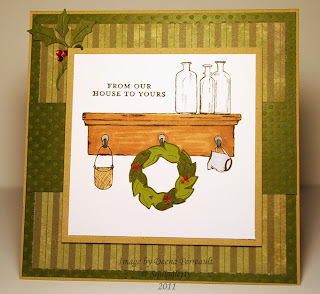 Love the added wreath to it! 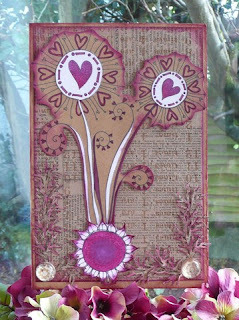 What style the leaves and little red gems add to this awesome card. Look at what Jenni came up with. The soft blues are so pretty. The scene reminds us of our younger Christmasses! 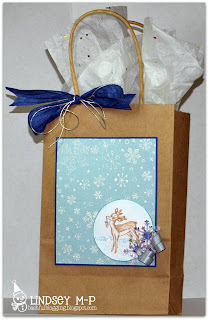 Love the giant snowflake and redd ribbon wrapping this beauty with warmth for the holidays. Love the scene Donna created here. Love the beautiful cut outs. 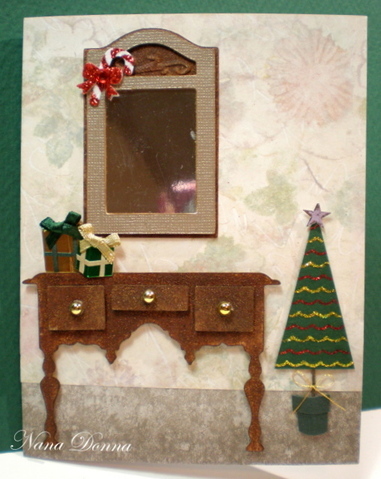 The details in the mirror and on the vanity too. 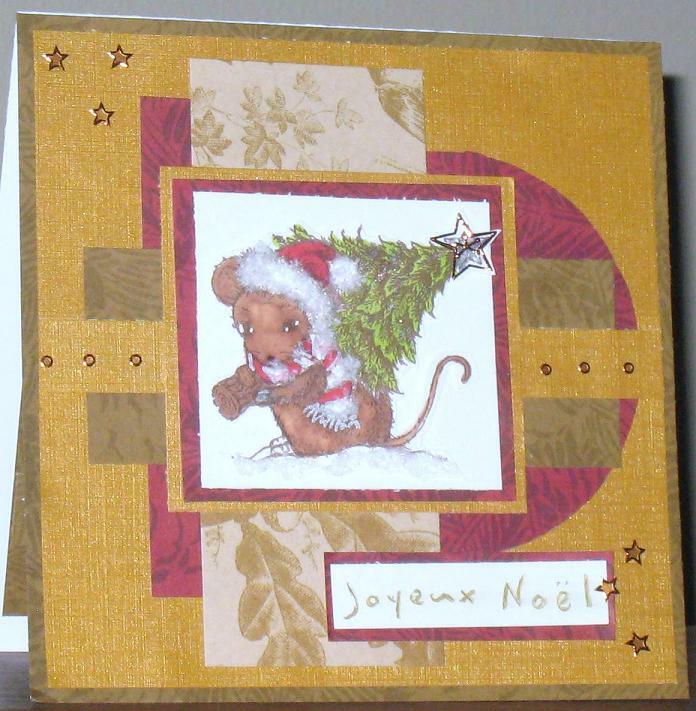 This little mouse is getting ready to decorate his tree. 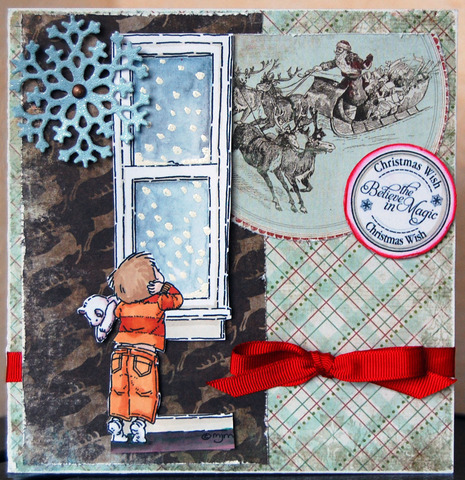 I just loved adding "faux fur and snow" to this image. Another cute scene of before Christmas. 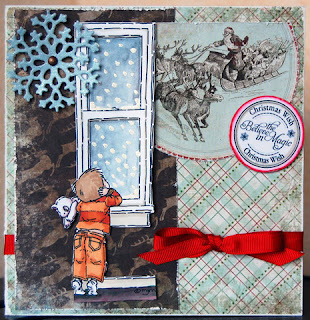 Love the background in the window and awesome embossing folder Juelmarie used. How so pretty! We can't wait to see your creations. Have fun with it; there is no right or wrong here! Be inspired and share it with us! Please use CCCW146 in your keywords when uploading to an online gallery, thanks! How ADORABLE is that little shoe! And an amazing tutorial to go with it! Pritesh please contact ME and I will get you to Deena. A card, small gift, or what not are always well appreciated, so lets see what you've got! I, Jaime, am sponsoring this week with a stamp set from CTMH. Now lets see what these amazing ladies have to show! 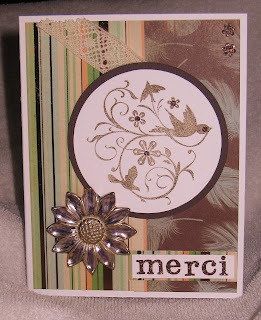 Here is GUEST DESIGNER Lindsey's beautiful thank you cards. 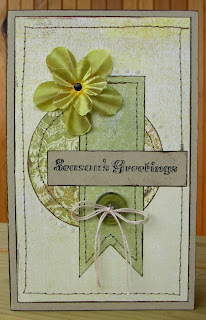 What a pretty flower Lindsey stamped on this simple printed background. Love this collage thank you, don't you! 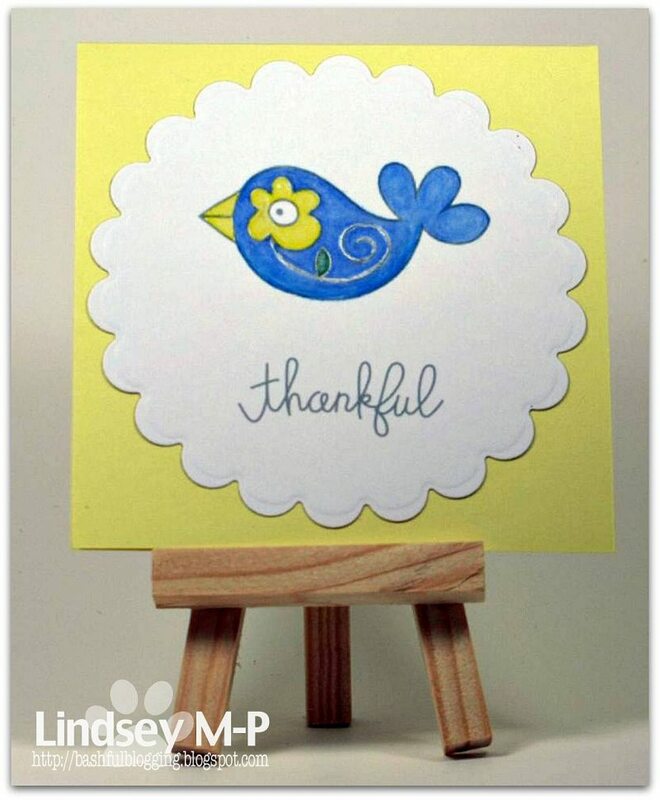 I just love the yellow and blue color combo Lindsey Cas-ed for us! 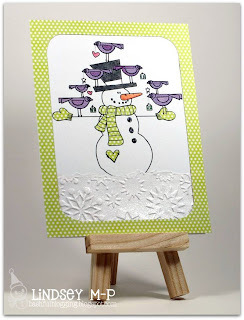 How cute the birdie stands out on the white scalloped die. 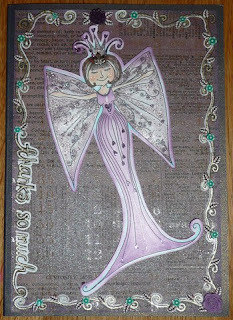 Claire's fairy Queen is awesome and I guess this thank you could be offered to a hostess, aren't they all House Queens! beautiful bordering which comes right off the dark chocolate embossed background. Way to go Claire. What a cute and feminine wayof saying thank you. 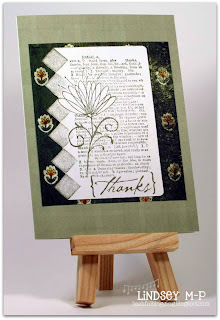 This crocheted bordered card is sooo pretty. 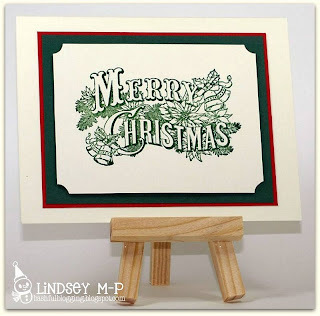 Check out the green crinckled ribbon and triple scalloped die frame. 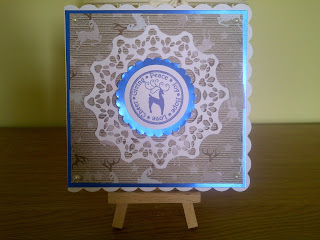 Jaime used this beautiful gold embossed clock and made a gift box too. Hosting and double crafting did you now Jaime. Love the blue sheer ribbon. The expression on this little darling says how from the heart her thank you is as she looks like she is offering a bird to us. Beautiful leaves and ticketed sentiment is such a clever way of adding a plus to this already pretty card. 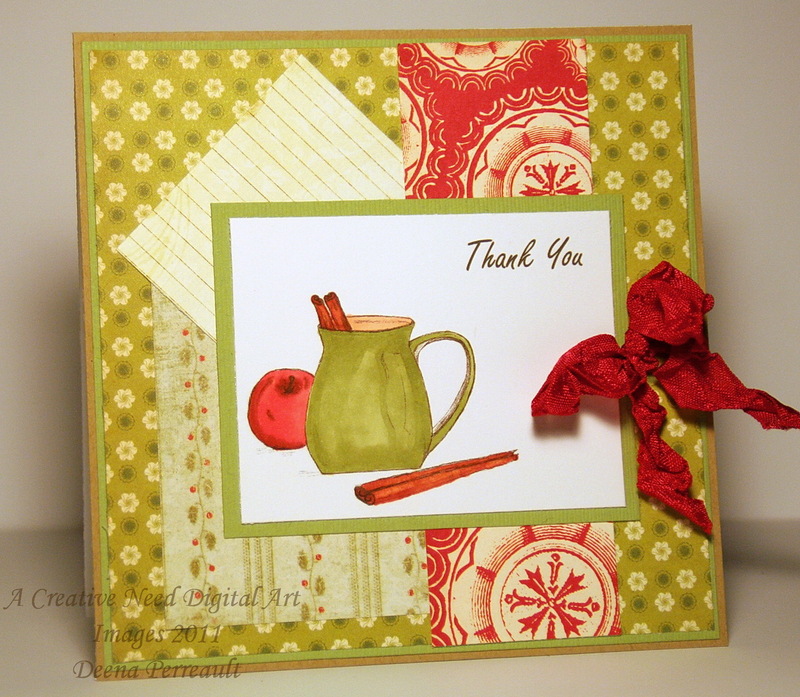 This apple cider cup is a warm way to thank someone over the holidays. Deena used beautiful dps also to showcase her own image. The crinkled red ribbon looks fashionable here. 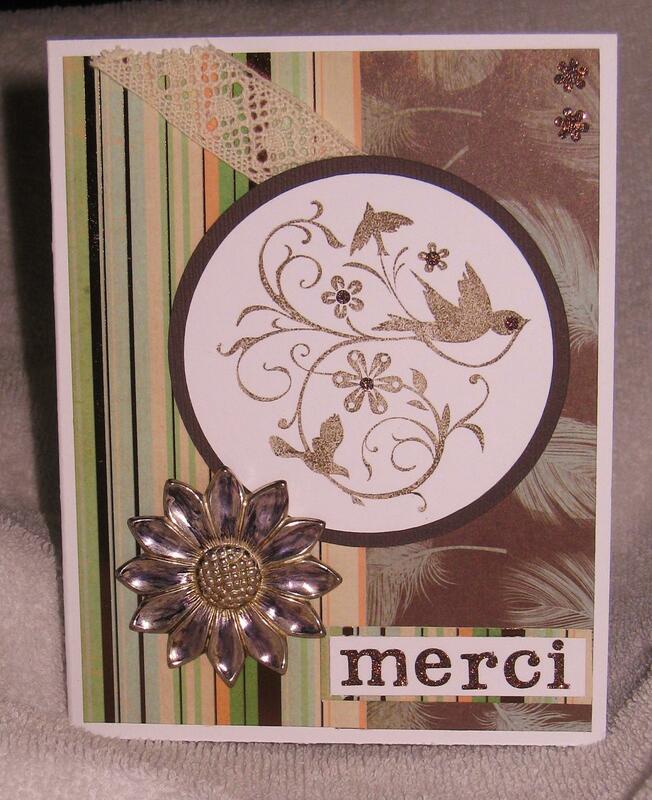 Using autumn colors for a French thank you. Peggy used a cool charm on the beautiful dps. Subtle and warm colors. Remember to link below for your chance to win. 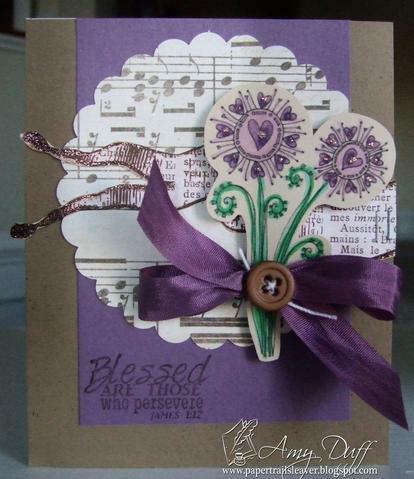 First I want to thank everybody that played along last week with Dawn's challenge idea of Peanut butter & Jelly! We all enjoyed your creations and had fun admiring them all.Our Congratulations go to Stephanie-Emma. So Stephanie, get in touch with Claire for your awesome prize of whimsical images at Hopejacare. 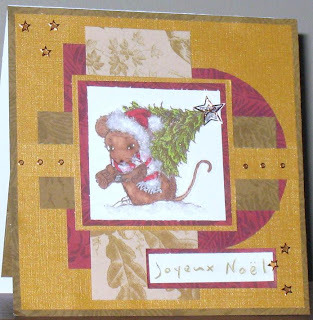 Peggy here and I have another fun challenge for today. 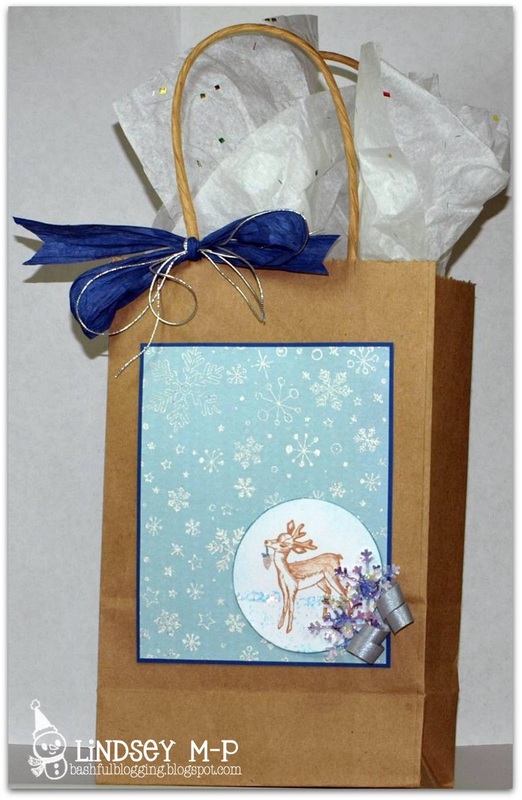 I thought maybe we could use any recycled item we have hanging around our crafting tables or in our craft rooms. Easy and good for the environnement right! 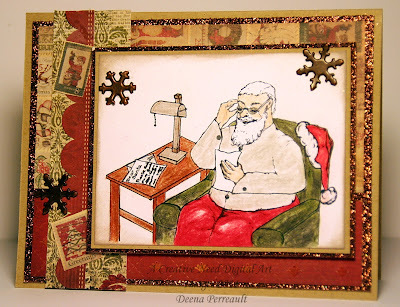 Another great surprise again is that we are using Deena's images from A Creative Need Etsy shop and she has fun new ones for the upcoming holiday cards we are all scrambling to do. 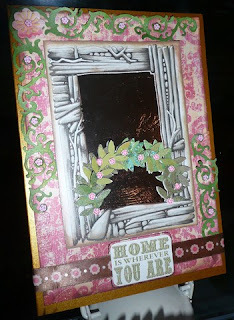 So make a card or any project using a recycled item and upload them here with a link to your blog for a chance to win your choice of 4 original images from Deena's shop! 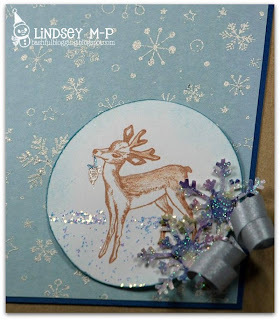 Lindsey used Deena's young deer image on some awesome design paper. Gotta love the close up of the ribbon embellishment adding pizzazz to the sparkly snowflakes and all in my favorite color blue! Excellent work don't you think! 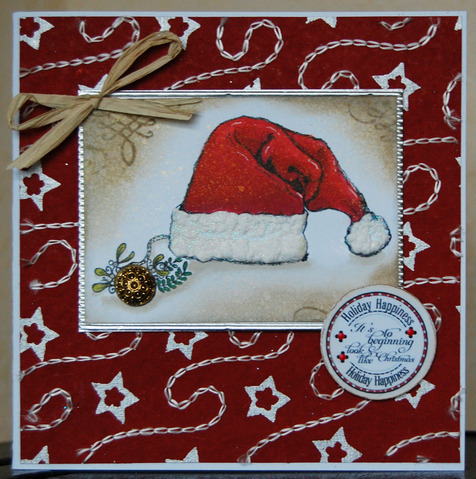 Love the liquid applique on Santa's hat and sleigh bell Jenni did. 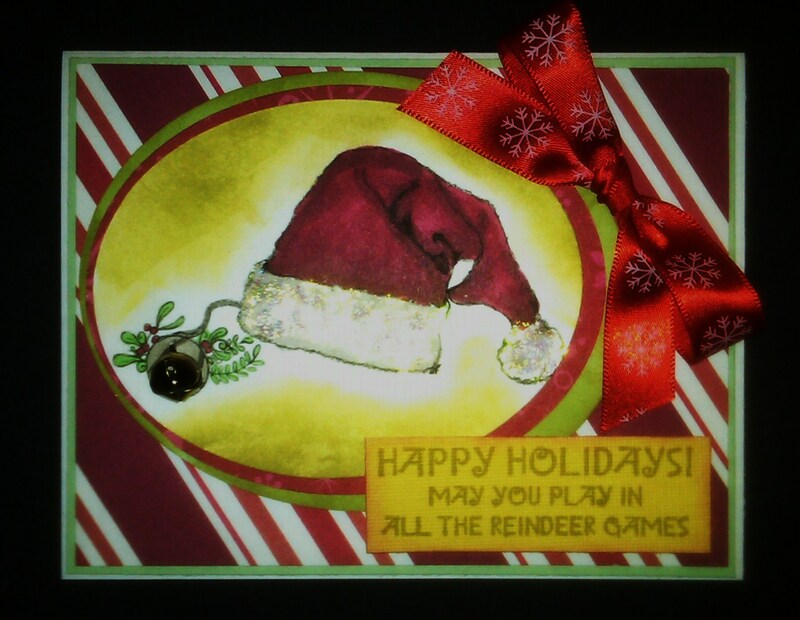 I love how Jenny colored in the hat and used the most "festive" looking paper. Check out the pretty charm on the bell.Awesome card! What beautiful soft pinks for this Hope branch image Deena created especially for the CAUSE. I love how Claire created such a pretty flower with the added leaves. 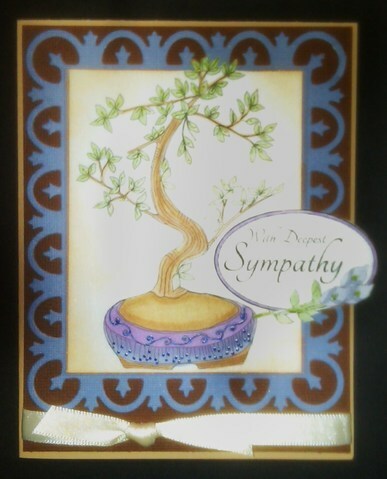 The DT is on a roll with this heartwarming card. What a surprise we have here. Deena has used some superb vintage design paper to match her NEW vintage Santa. 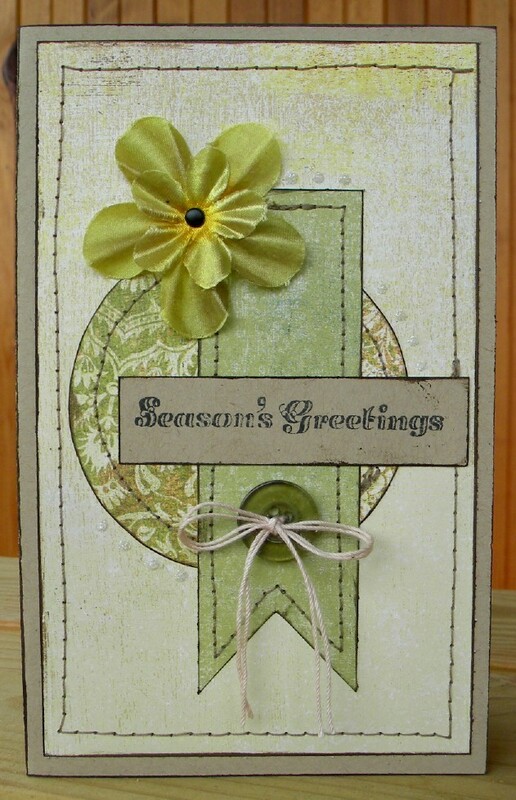 Check out the gold border, what a classy card. 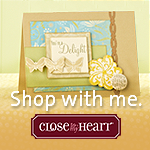 I am so excited to be sponsoring this week's challenge with my new images! Here's my card using my newest image "Dear Santa" released today! then painted with puff paint and tucked behind. As always, we await impatiently for your beautiful projects. Hi everyone! I'm glad you're here today as the CRAFTY CREATIONS TEAM is having a design team call. We are looking for passionate crafters like you! 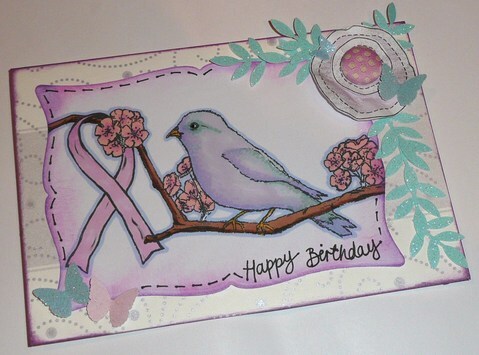 Are you willing to make one card/project a week for our challenges using stamps and/or our sponsors images? Are you able to commit to hosting (choosing a challenge theme and posting) one challenge every 8 to 10 weeks? Are you ready to have fun on a flexible and accommodating team that supports each other and works well together? YES? Then you're at the right place! Never been on a design team? NO PROBLEM! All interested crafters are welcome to try out! If you are interested please leave us a link to your blog and a comment to let us know that you would like to join the team! Also, please play in this weeks or next week's challenge and write DT next to your entry/name link. We will make our selection within the next couple of weeks. Thanks! your prize to you ASAP. for new challenge. Happy Crafting! Good morning, Dawn here and I'm your host for this weeks challenge. Thank you all for joining our challenge last week. 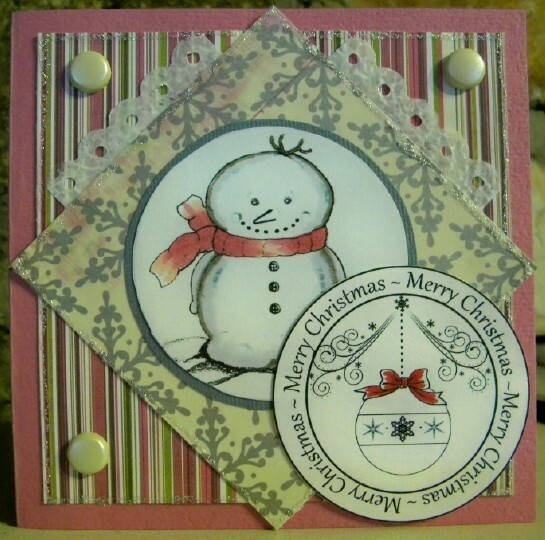 Lots's of lovely creations and inspiration. "Kraft/Brown, white/cream and one other color"
that's it. NO other colors. 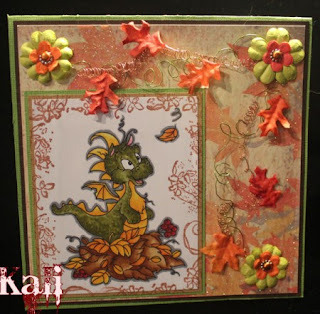 Isn't this the sweetest dragon you ever saw... well KALI used it on her card for our fall leaves challenge last week and won with our random generator: 52. Congratulations Kali, I love the fun leaves falling, the sparkle and the cutest dragon image ever! All the the DT members want to thank you for being so many to have played along with Jaime's challenge last week, we had alot of fabulous entries. 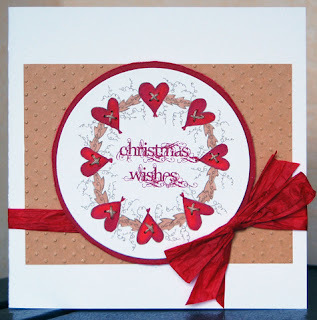 "I am so honoured to be guest-designing for Crafty Creations this month! I started collecting rubber stamps about 20 years ago, at first for use as an elementary school teacher. 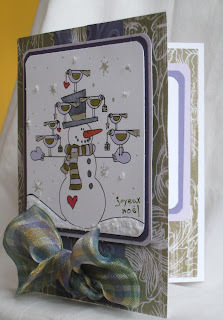 Then I saw heat-embossing demonstrated in a stamp store, and I was totally hooked. I started making cards more seriously about three years ago, and at the urging of friends, started a blog called BASHFUL BLOGGING late last year. My style is very clean and simple. Hope you’ll join us for the challenges this month!" Lindsey's work is one I visit regularly, first because she is so sweet and also for inspiration from her unique style of cardmaking. 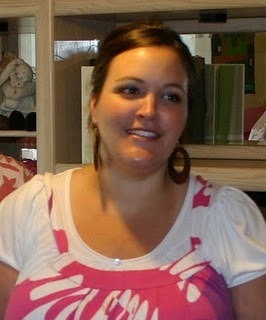 She is very CAS oriented and seems to have mastered the art of using less and making magic with her creative mind. 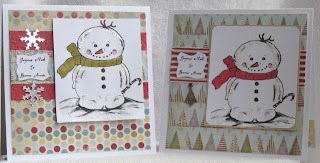 Make sure you stop by her blog and have a peek at what she is creating for you all month long. GREEN - PURPLE - SILVER - and snow in any way shape or form, ie, flower soft, fun flock, snow writer, crystal fine and even silver pearls (as I did with my penguin). You get the idea. So make sure you play again this week. Strech n' Bubbles is offering 5 digital images to our winner. Remember if you upload to scs used CCCW142 in your keywords so we can see your cards. 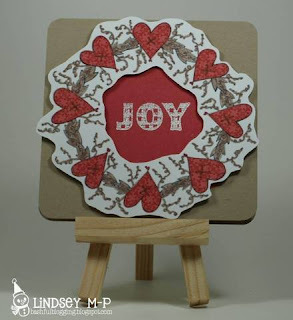 Don't you just love how Lindsey paper pieced the scarf, heart and mittens with this soft polka dotted dp. 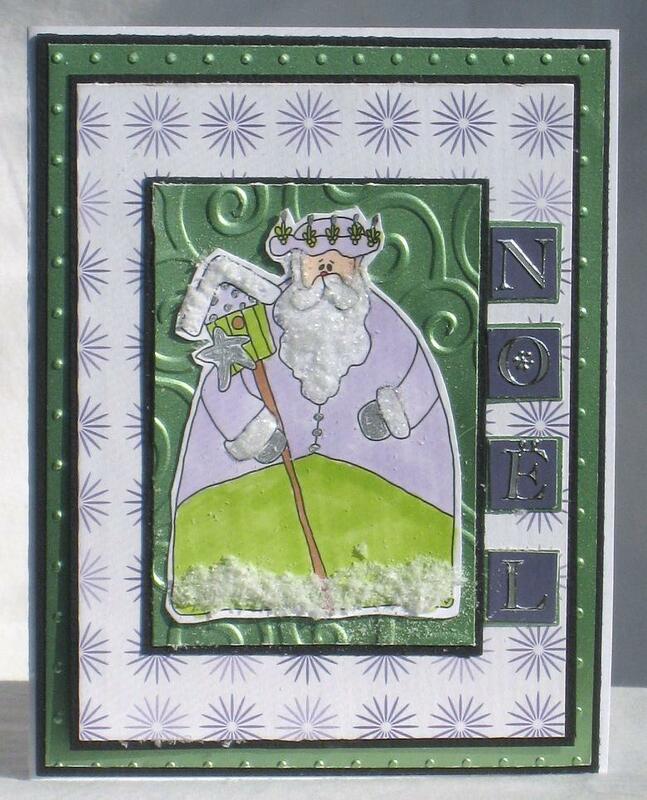 Gotta love the embossed "snowflakes." I just had to experience all the images our sponsor generously offered us. My fave is the penguin though. I absolutely felt like a kid playing with these , didn't even see the time go by. I love the pretty green Juelmarie chose, the sparkling snow all around the snowman and the little border "snow" too. 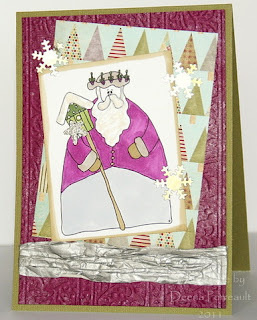 I love the paper Jenni used here. 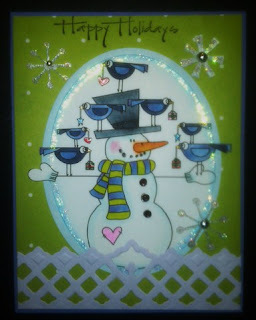 The giant snowflake, the rouned sentiment and the special attention in texture she gave to each birdie. I love that all this image. Donna added a fabulous silver frame complimented by a pretty silver ribbon and bow. Don't you just love the snowflakes. All the elements are here. Sure didn't miss this super background design paper. 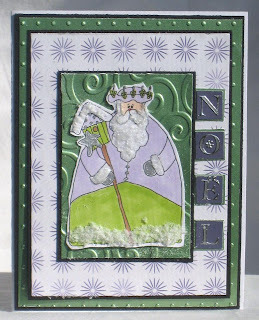 The crinkled silver border caught my eye right away, along with the sparkly star. Deena tilted her panels and that always makes me smile. She even added silver mist to the background. 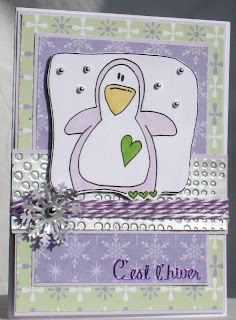 I love how she paper pieced this cute penguin, giving it the whimsical trademark I know and love about Claire. Check out the sparkly snow! 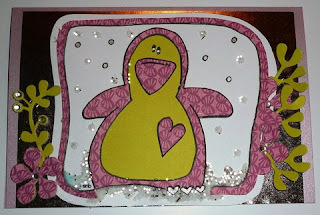 How sweet is this little penguin posing proudly in front of his giant, sparkly and beautiful snowball. 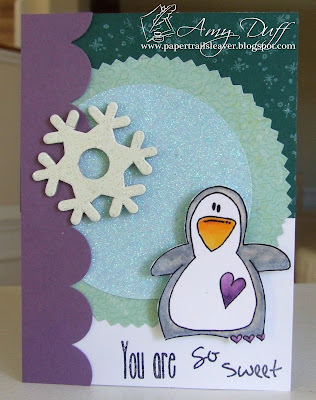 Love Amy's style, check out the big SNOWflake too! Please add keyword CCCW142 if you upload to online galleries! Thanks!